I’ve always tried to treat the stage of life I’m in as the best stage of life. Punting for 12 years in the NFL was great, don’t get me wrong; but this stage of life post-NFL has its own advantages, too. Now I’m able to spend more time with my family. I get to invest more in my music career. 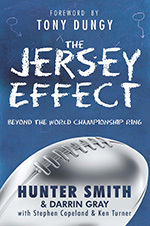 I have the privilege of doing new things, like writing The Jersey Effect. I don’t think I struggled all that much moving on from the NFL because I accepted it. I saw many of my former teammates adjust poorly to normal life after football because they didn’t have anything going on. They didn’t know what to do. But I just decided to accept that I had crossed the line—my playing days were over—and it was time to move on. My wife, Jen, and I believe life is better now. It’s not better because football was worse. It is better because we are continuing to grow in Christ and in our purpose in Christ. It is the next chapter of life, and it’s better because I’m with God. Life sometimes feels like a giant transition. It is always changing. And sometimes the most challenging thing is to accept that it’s changing. But being with God and knowing that I’m growing in Him has given me contentment, and even excitement, in transition.